A great challenge this week from Bah Humbug. It gave me the opportunity to use an image I've been hoarding for ages. Its from an old family photograph taken in the 1930s and includes my mother (bottom right corner). First of all, I used a scalloped card from Papermania and gave it a red insert and trimmed the top corners. The image was then mounted onto holographic red card and a matching tag made with ribbon and peel off lettering.I framed the image again with outline peel offs and added three little diamantes to the bottom right of the image. I also added some diamond glitter glue to the scalloped edges of the card. A sparkly snowflake embellishment finished off the card. I can agonise over the design of a card so when I'm happy with a result I make more! 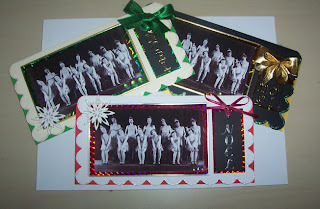 This time I used black on gold and cream on green to make two extra cards. Would love to hear from my visitors, so please comment if you can.